This overview of motorcycle protective clothing is tied in with my 'hobby' of photography. So you have passed your CBT or perhaps you have taken a further step and immediately followed up the CBT with the Government Theory Test and the Direct Access Course to gain a full motorcycle licence? Your first motorcycle is a financial step but selecting protective clothing is unfortunately a necessary extra expense. The complete rigout - the boots, trousers, base layers, jacket, gloves, neck scarf and helmet including winter thermals could cost in excess of £1,000.00. For sports bike riders who prefer a one piece leather rigout, the cost could be even higher. Many a first time motorcycle rider has walked into a motorcycle clothing store and purchased clothing for wearing on their new bike without any serious consideration as to it's limitations. Only by riding their motorcycle in various road and weather conditions throughout the year will they discover those limitations and invariably they may have to make further purchases. I gained a full motorcycle licence in 2014 and I am in my late 60s. I investigated what clothing to purchase for my two motorcycles and I had to take into account that my first bike was a 'sports/tourer' for touring and the second, due to be purchased a year later, would be an 'urban bobber' for street use in the city and for short blasts on country roads. I have to thank Grant Cameron of Saltire Motorcyles who provided the clothing consultancy and assisted me in making my final decisions. More regarding my motorcycles and my clothing in It's a Lifestyle Thing. The overall budget you have at your disposal is an important step as the clothing consultant has to prepare a list of clothing to maximise your protection within that budget. Just as important is to make the consultant aware of the type of motorcycle that you will be riding and your style of riding - touring, adventure touring, cruising, sport, 'off road' adventure. Sometimes a novice rider making their first purchase of protective clothing does not take into consideration the style of the clothing which is in keeping with the type of motorcycle they ride and the way they want to portray themselves when riding the bike. Only after they have ridden the bike for a few months in different weather conditions and alongside other motorcyclists do they realise that they may have made the wrong decision regarding their choice of clothing. If the style of their motorcycle and their look on the bike is just as important as the level of protection then the clothing consultant should be informed of these pre-requisites and coupled with the known budget can make the correct analysis of the protective clothing required. The novice rider invariably does not consider a chest or back protector but as their confidence and abilities increase along with the road dangers from other road users, so they become more aware that perhaps chest and back protection should be considered. I spent a great deal of my research for motorcycle protective clothing on the Internet and in discussion with my clothing consultant. I took my time but eventually I concluded that sticking to a single brand manufacture for my textile jackets and textile trousers was essential. This offered me continuity as the sports/touring and urban street jackets and trousers each had connecting zips to join the clothes together (if required in bad weather conditions) and the fitting sizes matched. My leather jacket was also the same brand but my casual jeans came from a different manufacturer because they offered a high level of protection whilst maintaining the style that I wanted which I considered essential. Some motorcyclists prefer high visibility in their clothing with reflective strips and broad reflective areas in the chest and back. High visibility is often the norm for touring, especially in bad weather conditions or at night on unlit roads when visibility is limited. Usually, high visibility (longer style) jackets and trousers are made up of textile material with waterproof and detachable thermal linings. Some motorcyclists prefer an all black look with no reflective materials such as a short leather jacket and protective jeans for warmer weather or an all black textile based short jacket and textile trousers with waterproof and detachable thermal linings with the minimum of (dark style) reflective strips for ALL WEATHER use. Usually the helmet colour is determined (for effect) by the colour of the clothing. Lumbar support is often overlooked when purchasing motorcycle clothing - even by those riders who are in peak physical condition with strong lower back and side muscles. Invariably riders only become aware of strain on their lower back and kidneys after they have ridden a motorcycle on touring or during prolonged riding trips. This lower back pain can prove deceptive because the rider can suffer injury to the vertebrae as well as the kidneys which at first manifests itself as a dull ache in the lower back but the following day can become more severe. Compression of the spine through prolonged riding of a motorcycle over hard bumps and lack of back support can lead to bruised kidneys (serious ailment) as well as a hernia, slipped disc, disc compression and a herniated slipped disc which bulges and presses against the sciatic nerve causing great pain down either leg or both. Posture is all important and whilst some motorcycle seats have excellent seat cushioning and suspension to prevent the jarring of the spine and kidneys whilst travelling over potholes, the support of the lower back remains crucial during those longer strips. If you feel that ache in your lower back and you gain relief by arching your back, then your posture and lower back support is at fault - don't ignore it! Travelling over a pothole on a motorcycle with hard rear suspension can damage you coccyx - the tailbone of your spine. The coccyx can become compressed but even without pothole damage, a long ride on a hard suspension can overtime lead to permanent damage and pain that manifests itself in later life. You can purchase third party gel or air cushions, especially an aircushion like the one from AirHawk that specifically protects the coccyx, the scrotum and the prostate. Lumbar support kidney belts come in two forms and either can be worn around the waist under a motorcycle jacket which has a conventional CE Level II back protector fitted in the jacket's back pouch inside the jacket. The first one is the orthopedic type which is specifically designed for addressing back pain by providing lower back and kidney support and which invariably has strengthened stays in the material (no impact protection) to provide a strong support structure for the back. The second is a hybrid kidney belt specifically designed for motorcyclists which has some of the qualities of the orthopedic type but with impact and slide protection sewn into the material. Lumbar support can also be found in some full back protectors which are worn under the jacket using braces (waistcoat style) and in certain styles of seats, predominantly those found on motorbike cruisers like the Harley Davidson. The material used in motorcycle protective textile clothing varies and each manufacturer may have their own development with similar materials under different names. Popular materials which can be found in a textile jacket and trousers are 600D Polyester which is interwoven to create a high density fabric that resists abrasion and tearing. Lorica which is constructed from microfibers and gives certain parts of the jacket a natural leather look, Polyester Rib which is extra strong and forms the shape of the jacket and Gore-Tex waterproofing. In more expensive jackets you will find Cordura 100% polyamide woven yarns with Teflon waterproof coating, 750D Polyester, Gore-Tex, Schoelier-Dynatec mesh panels and Neoprene synthetic rubber which is stretchable and waterproof and usually used for covering zip and fastenings. A reasonably priced textile jacket for ALL WEATHERS use will also include a removable waterproof membrane lining and a removable thermal lining. Usually in higher priced textile jackets, a storage pouch is sewn inside the back of the jacket for an optional CE Level II approved armour back pad. A typical leather jacket is made of MAX Cowhide Nappa leather with reinforced stitching with armour in the shoulder blades and elbows. Usually in higher priced leather jackets, a storage pouch is sewn inside the back of the jacket for an optional CE Level II approved armour back pad. Your protective clothing should be able to withstand at least a 4 second (low fall) body slide on a tar road where the most likely injury you will sustain is a slight friction heat burn to your skin whilst your clothing remains intact. If your motorcycle skids out at the rear and then abruptly stops you could be propelled upwards and over the top of the bike (a high side) whereby you might fall from a height of several feet (usually in excess of 6 feet) onto an elbow, shoulder blade, knee, back or a combination of these areas, followed perhaps by a tumbling slide (determined by bike speed) on a tar road for several seconds. Jackets - Optional Back Protection: When you purchase a textile or a leather jacket it will invariably come with a inside back pouch for an optional CE Level II approved armour back pad which protects the spine BUT many riders later decide to upgrade the armour by removing it and then purchasing a separate waistcoat style CE Level II approved armour which can sustain a higher impact and which protects the shoulder scapulas, spine, lower back, kidneys and is fitted on the body with it's own Velcro waistband and shoulder straps and the rider's jacket is then fitted on top. This type of armour may require more room due to it's thickness, especially if there is also an optional chest protector that fits onto the front of the waistcoat. If you intend to upgrade the back armour at a later stage, consider the size of the jacket you will require. Casual Jeans: You can also purchase casual jeans (as well as jackets) which are manufactured using Kevlar or Cordura to give them a natural feel around the legs although slightly heavier than normal jeans. These types of jeans have sewn inside pouches in the hips and knees to accept CE approved armour that can be removed when cleaning the jeans. Kevlar and Cordura are materials that offer heavy abrasion and tearing protection and most jeans have a 'seconds' marking which tells you the number of seconds the jeans can slide on a tar road before they start to wear through. Budget vs Maximum Protection: For your budget, you are seeking the maximum amount of clothing material protection and the pre-requisites for armour are fittings in the back of the jacket, the elbows, shoulders and knees and hips in the trousers. It is essential that when the clothing is worn comfortably in a normal standing position, the armour is correctly covering the joints. When I am wearing my casual protective jeans, I prefer to wear the jeans knee armour in separate special knee stockings because the jeans are a perfect fit but the jean adjustable pouches with the knee armour fitted still do not match up to my knee joints correctly. Motorcycle clothing will come in various levels of material and armour protection which determine the price, so careful consideration must be given to the technical information available and the clothing consultant can assist in this analysis. Adventure bikers (off-road) are exposed to the very real possibility of dangerous accidents where the highest level of protection is necessary. To protect against a broken neck many adventure bikers will wear a LEATT or MOVEO neck brace that prevents the head rolling around in a high impact tumbling accident where the rider is thrown of the bike and downhill. Sport bikers will also wear neck braces to protect against neck injury in a high speed accident where they might be thrown over the handlebars. Textile jackets are the favourite for adventure riders so many jackets (like the Rev' It Sand II jacket in the main image) have (red) loops manufactured into the front and back to which the neck brace collar is secured. Special air bag jackets (leather and textile variants) are available which have a built in (deflated) chamber in the back, neck, waist and front torso which has a small gas canister in a front compartment of the jacket with a short lanyard clipped to the release valve with the other end clipped to a second fixed lanyard on the motorcycle. The idea is that if you are thrown off the bike, the lanyards are pulled by your body weight which releases the gas valve (also detaches the jacket lanyard) in the canister which instantaneously fills up the inner chamber with gas to absorb any impact to the body torso and pelvis areas. Within seconds after impact the inner chamber deflates and to make the jacket ready again, all you have to do is replace the gas canister with a new one and reconnect the jacket lanyard to the canister release valve. The jackets are designed that if you step of your bike without unclipping the lanyards, the canister will not fire the gas but hold you at the bike until you unclip yourself. Another but more expensive airbag is the type that has electronic sensors fitted to the front forks and frame of the bike which upon sensing a crash transmits a radio signal to the airbag receiver which instantly inflates the airbag - there is no requirement for a lanyard to connect the airbag to the bike frame. Alpinestars Tech-Air airbag system is a self contained vest (worn under a Alpinestars compatible jacket) with has an inbuilt electronic sensor module in the back of the vest with a rechargeable battery. The module connects inside the jacket which has an LED display warning panel on the outside of the left sleeve. There are no other connections to or on the motorcycle so the rider can interchange bikes with ease. They also supply 2 jackets (as at 30th August 2015) with the Tech-Air airbag system built into them as opposed to the vest worn underneath. For the very highest level of back and chest protection for sports riders who may experience a high speed crash where they are thrown high into the air it would be prudent to wear an airbag system (jacket or vest) which will offer the maximum available protection to absorb the impact AND a 'High Level' CE Level 2 back and chest protector fitted under the airbag to offer further protection against 'sharp object' penetration. Air bag jackets are expensive but you can also purchase air bag vests which operate using the same method and slip over your own jacket. Most manufacturers have developed back protectors which reduce the amount of the kilonewtons by spreading the impact on the back and dissipating the force. The current armour protection standard is CE Level II and you will find that the majority of jackets will include a pouch in the inside/back of the jacket for a back protector pad to be inserted. The CE Level II standard is a back protector which can withstand and dissipate a high impact force down to at least 9 kilonewtons. Some manufacturers have gone beyond the 9 kilonewtons standard and have developed a separate professional back protector which covers more of the shoulders, back, tailbone, kidneys and is capable of reducing the force to the back to under 4 kilonewtons. 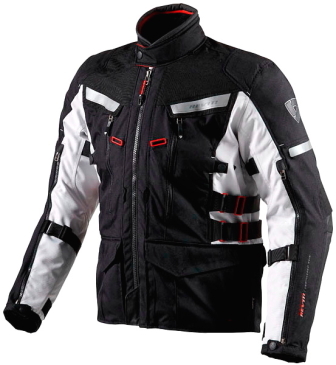 It is designed to be worn underneath a motorcycle jacket which already has elbows and shoulder armour protection. Some of these professional back protectors have the option of a chest protector (add-on) which guards against sharp penetration, such as rocks, branches and protruding parts of the bike such as the pegs. Obviously even these back or chest protectors can be penetrated or crushed into the body because it all depends on the force of the impact but a sports rider seeking the highest standard of protection which exceeds even Level II is not a bad ideal. These back and chest protectors are more expensive and usually come in a waistcoat jacket or held on by braces and worn under the rider's jacket. More on back protectors in my Forcefield Pro Sub 4 Back Protector Article. Some motorcycle jackets include removable layers but in very warm weather even with any layers removed and jacket zip vents opened you can still experience overheating and sweating. A third party base layer is important and although some bikers just wear a sleeveless T shirt, I have found that even with just a T shirt under any of my jackets, I tend to sweat and worse when I try to remove the jacket, the jacket sleeves stick to my bare arms. This is the main reason why in normal weather I wear a long sleeved T shirt so that my jacket does not stick when taking it off and in very warm weather I tend to wear a professional base layer with sleeves which is specifically designed for athletics and is a tight compression to my overall upper body. The downside is that it is an expensive item but well worth it. You can also get base layers for your legs which I have never purchased or required in the summer months but in the winter or during extremely cold days, I just wear the thermal lining supplied with my textile trousers. You will require several base layers unless you want to wash one pair after you go out on the bike in warm weather - using alternative base layers means that your motorcycle jacket will require less cleaning. One of the most vulnerable areas for cold and wet drips when riding a motorcycle is the neck area between the jacket and the helmet. A neck scarf is ideal to fill the gap and also can be pulled up over the nose to keep the face warmer. You can also purchase thermal base layers for the legs and torso as well as a cold killer tube which fits over the base layer shoulders and the top of the chest and back, up the neck and over the nose area with a net vent. The jacket and helmet are then put on to seal and make the entire area wind tight from the cold. There are many types of motorcycle protective boots, including casual kickers, laced and steel edged sports variants. It is important to ensure that your boots have adequate reinforced protection, especially around the ankles where the most damage is likely to occur if you twist your foot in an accident. I prefer boots that come well up my calves for maximum leg protection and that slip on, zip up and have leather velcro flap fasteners over the zips. I just find them easier to put on and to take off - it is purely an old age related thing. My boots are relatively slim so they are easy to fit in-between the peg and the gear shift lever for changing gear and with substantial grip on the soles so I don't slip off the pegs or when using the rear brake. I purchased Gore-Tex waterproof boots for ALL WEATHER use and for walking around when the bike is parked up. It is essential that boots are comfortable when on the motorcycle and yet (in my case) just as comfortable when walking about in the town. In the winter and during extremely cold days, I wear thermal socks inside my boots. I have two sets of leather gloves, a heavy pair which have long cuffs that fit over my jacket cuffs for touring in bad weather and the cold winter months as the wind and rain cannot blow up my jackets cuffs and my hands stay relatively warm. These heavy gloves also offer the maximum amount of crash protection due to their heavy armour but the downside is that whilst travelling on town roads in start/stop traffic I don't have the same quality of finger control on the horn, flasher, main beam light and indicator switches. These heavy gloves take longer to put on in relation to my smaller light leather gloves which are cuffed inside my jacket cuffs, less water resistant and less warm (in cold weather) but are much easier to use with the controls and still manage to maintain a decent level of armour protection. Motorcycle helmets vary not only in head size but also in the style and the number of layers that make up the protective shell. Some have interchangeable inner lining sizes and emergency release mechanisms where in the case of an accident the ambulance crew can pull a couple of red tabs and release the shell casing leaving the inner soft lining on your head. There are many styles including helmets for off-road, training instructors, cruisers and sports bikers. The manufacturers' and models vary as do the prices. Generally the more expensive the helmet the higher the crash protection specification and add-ons, like flip down sun visors and vents at the front and back which can be opened during warm days. The type of belt webbing and clasp that secures a helmet to your head is just as important a consideration as the helmet itself. A helmet can prove to be a heavy item to carry around on your head so ideally you are seeking a lightweight variant with a reasonably high specification for crash protection. A full face helmet offers protection for the chin area and most include a 'flip up/down' clear visor and some also include a carrying cloth bag with draw string. To avoid your visor steaming up you can purchase a 'clip on' inner pin lock (anti-fog) visor which creates an air gap between the inner and the outer one. You can also purchase a smoked visor which is ideal for very bright well lit days but should not be used in bad light conditions or during the night. When selecting a helmet, make sure that you heed expert advice in making the correct choice. A helmet is not like a hat, it can make all the difference between life and death in the event of an accident. There are helmets out there which cost a little bit extra and have built in sun visors that flip down behind the clear visor by flicking a switch on the side of the helmet. However, most riders select a helmet because of the comfort factor and invariably they are supplied with only a clear visor. There is no doubt that a smoked visor looks cool on a black full face helmet but you have to consider, do you really want to continually swop visors from smoke to clear dependent on the weather, which here in Scotland can very quickly change from a very bright day to dull light and heavy rain and then back again. Also a smoked visor is not ideal for visibility at night but I guess the overall cost of having two visors is probably the limiting factor with a smoked visor costing around £45.00 and a pin lock (anti-fog) visor for clipping inside costing another £26.99. This makes the overall costs of two visors (clear and smoked) with pin locks costing around £143.98. Alternatively the answer for riding a motorcycle on very bright sunlit days is a pair of sunglasses which can be used and removed without removing your helmet. Of course the overall cost could prove more expensive as you will still require a clear visor and a pin lock (anti-fog) inner visor for 24 hour use in all weather conditions. The sunglasses should be especially designed for using on a motorcycle and made of ballistic materials to withstand a high velocity projectile impact (when the visor is up or down) without shattering. Ideally, they should have a facial cavity seal to block out peripheral light and debris with outward reflective and polarized lenses with a solid frame. These type of sunglasses usually cost around £119.00 and above.